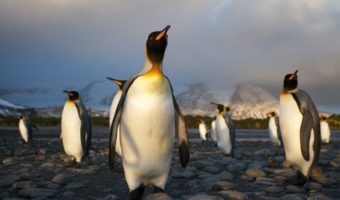 King Penguins live on the subantarctic islands at the northern reaches of Antarctica, as well as Tierra del Fuego, the Falkland Islands and other temperate islands of the region. The King penguin is the second largest penguin. It is sometimes confused with the larger Emperor penguin. Despite the specific name of ‘patagonicus’, King penguins no longer breed in Patagonia, or indeed any other part of South America. King Penguins would previously breed on Islas de los Estados (Staten Island) until the colony was wiped out by sealers during the 19th Century. 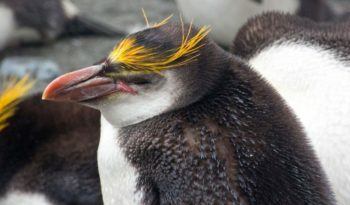 Distinctive features of the King penguin include a silvery-grey back with a blackish-brown head decorated with striking ear patches of bright golden-orange feathers. Adults are 90 centimetres tall and weigh about 15 – 16 kilograms. King penguins have adapted well to their extreme living conditions in the subantarctic. To keep warm, King penguins have four layers of feathering. The outer layer of feathers are oiled and waterproof, not unlike the feathering of a duck. The inner three layers are down feathers which are very effective insulation. A chick is born without the oily outer layer and therefore cannot fish until maturity. King penguins eat small fish, mainly lantern fish and squid and rely less than most Southern Ocean predators on krill and other crustaceans. On foraging trips they repeatedly dive to depths over 100 metres (350 feet), often over 200 metres (700 feet). This is far deeper than other penguins, other than their closest relative, the larger Emperor penguin. Ice and water in Antarctica is primarily salty, making it impossible for most animals to drink. The king penguins stomach, however, has adapted to drinking salt water. Its powerful stomach can separate the salt completely, allowing the bird to drink without becoming dehydrated. 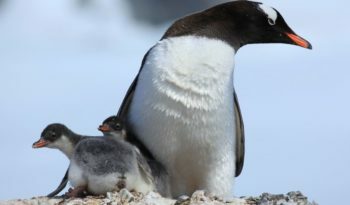 Although their climate is far less harsh than that endured by Emperor Penguins, the large, closely-packed colonies are able to survive the winter storms by combining the body heat of the community. Tens of thousands of birds may huddle together for warmth. King Penguins are sleeker than other penguins, with proportionately longer flippers. The King penguins hydrodynamic body allows it to glide through the water with ease. The famous penguin waddle is an obvious way for the penguin to get around but there is a much faster way, the King penguin just uses its stomach and slides along the smooth plains of ice. This is called ‘tobogganing’. However, unlike the Emperor Penguin, the King Penguin lives on rookeries on land that is free of ice for much of the year, and as most colonies are on beaches, King Penguins do not need to travel as far over land as their larger cousins. Although accurate counts have not been carried out in recent years, St Andrews Bay on South Georgia, has a single colony, which has grown partly due to the increased space available from glacier retreat, which may have 500,000 King Penguins at the busiest times of year. The male King penguin incubates the egg as much as male Emperor penguins do, however, the King penguins do this during the warmer summer season, when more food is available. Once the egg is laid, the male will care for it. 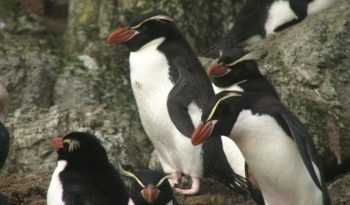 The female goes to the open sea and will return in around 21 days to take her turn keeping the egg warm. The male will only go about one month without food. The chick hatches in around 54 days. The chick is cared for by both parents for 30 to 40 days. At this time it joins a crèche for warmth and protection from predators. The parents return to sea to feed. They take turns bringing food to the chick every other day. The chick grows quickly during the warm summer weather. When autumn and winter comes the parents go back to sea to feed. The chick grows a warm brown fluffy down of feathers. They also grow a thick layer of blubber to keep them warm during the winter months ahead. The chicks huddle in their crèches during the winter months while the parents occasionally come onshore to feed them. In the spring the parents come back and start feeding the chicks again. At this time, the chicks starts to grow their adult feathers and are ready to go off on their own. Raising a King penguin chick usually takes 10 to 13 months. This allows the adults to raise only one chick every other year. Early explorers of the region thought the brown chicks were another species of penguins. 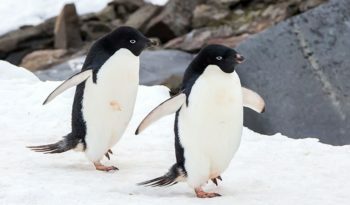 They called them the ‘woolly penguins’. 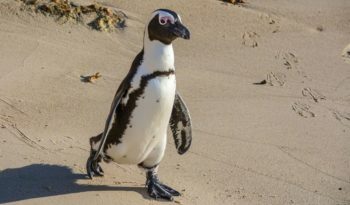 At sea, the key predators of King penguins are the leopard seals and killer whales who wait beneath the surface near the shore for unsuspecting birds. 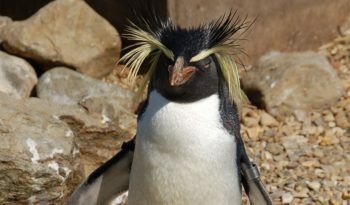 Human impact is currently very low, despite King penguins being a great tourist attraction in the Falklands. King penguins are very tolerant of human presence and are not alarmed by the presence of tourists, provided that they remain at the outskirts of the colony. There is no direct exploitation of King penguins and they are seldom caught as a result of commercial fishing, other than through the occasional discarded net. There is very little overlap between the prey of King penguins and commercially harvested species of squid and fish. Fishing industries are therefore unlikely to greatly influence King penguin population trends. With an estimated population of nearly 2 million pairs, there are no particular concerns for this species at present.